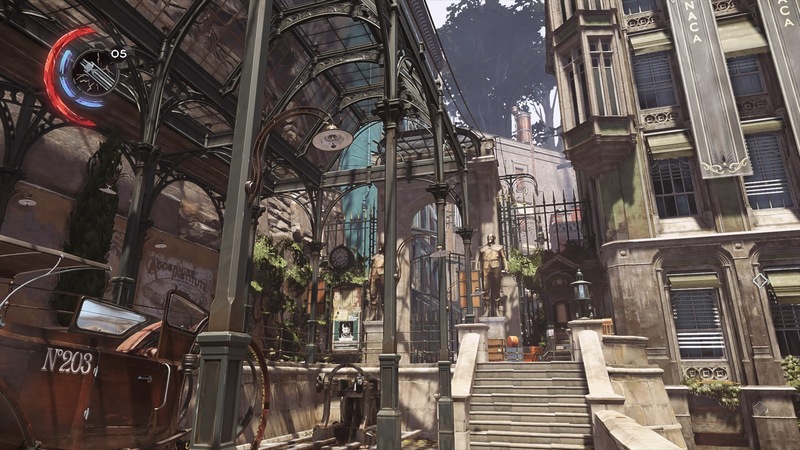 Don’t want to cause a commotion in Dishonored: Death of the Outsider? Looking to earn the Low Chaos ending? Here’s more than a few methods to help Billie Lurk navigate the truly massive second mission. Rather than target villains for assassination, Billie must track down two targets and acquire the keys they’re carrying — all to steal away the twin-bladed knife that was used to create the Outsider. Instead of boring you with pointless step-by-step instructions, here we’re focusing on the big picture and provide tidbits and tips you might not realize as you explore the rich streets of this section of the city. You’ll have to deal with two wily targets, and their personal weaknesses can be exploited in a variety of ways. See how to easily gain entrance to Shan Yun’s house, or how to steal Jacobi’s office key with hardly any effort at all. It’s all about finding the sneakiest, safest methods for completing every objective. Mission 2 is a lengthy job with multiple optional paths to victory. The first objective is always so the same — infiltrate the Red Camellia Beauty Parlor and raid the documents for more information on the Eyeless leaders. Billie Lurk’s goal is the hidden twin-blade that was used to kill (and create) the Outsider. The only weapon that can kill the god. Use Displace to blink across to the band on the high balcony, then turn right at the stairs to find a back-alley. Displace over the fence and behind the sleeping dogs to find the back entrance into the Red Camellia Beauty Parlor. There’s a single civilian inside — knock her out or sneak by. NOTE: While exploring the Beauty Parlor, stop inside the backroom and interact with the chair in the tattoo parlor. Here, you can tattoo yourself to gain access to the Spector club without sneaking through Shan Yun’s mansion. Your target is in the back office, on the large desk. Read the open ledge to get two names; Ivan Jacobi and Shan Yun. Both of these characters have information you need to find the knife’s location. You’ll need to investigate both to steal their keys and learn the location of the knife. Start with Jacobi’s Office. It’s the easier of the two locations, and the information in his office will make infiltrating Shan Yun’s house much easier. Jacobi’s office is locked, and the man himself is carrying the key. Visit his office and check the message pinned to the door to learn Jacobi’s location — he’s practicing a speech in nearby Colibron Plaza. The plaza is swarming with guards, making it tricky to lift the key without being noticed. There are two ways you can steal the key. Sneak into the plaza and use Displace to reach the small office directly behind the stage. Use the entrance to the right of Jacobi — no guards are watching that door. Jacobi will wander close to the opening in the tent, letting you easily pickpocket him. Go to the underground area (through the nearby stairs, left of the stage) and activate the lever to drop Jacobi down through the stage. This kills him instantly. You can also pretend to be a door man. Make a civilian disguise and talk to Jacobi, and he’ll simply give you his office key. Inside the office, go to the desk and find three important items. Take the key from Jacobi’s desk. This is one of two keys you’ll need to open the safe deposit box where the twin-bladed knife is located. Read the note in Jacobi’s desk shelf to learn about a journalist in the Spector. You can slander Jacobi with the right evidence. Interact with the painting behind the desk to find the evidence you need. Take the blood vial and note for proof that Jacobi is a murder. Next, we need to infiltrate Shan Yun’s mansion. How To Slander Jacobi: To completely slander and discredit Jacobi, make sure to visit the journalist near the bank. Give him your evidence to ruin Jacobi. Shan Yun’s mansion is located directly across from the Spector club. The areas are connected, but the best way is through the front door. Sneak into Shan Yun’s girlfriend’s apartment near the Beauty Parlor, in the statue square. Look in the blue apartment building. In her apartment, find the note “Our Secret Knock” then interact with the mansion front door. You’ll perform the secret knock and be allowed inside. Shan Yun’s house is a separate instance, and it’s a large interior area. Go to the kitchen and crawl into the dumb waiter to ride up to the upper floors without being detected. Use Semblance to more easily navigate the heavily-guarded mansion. Enter the room to the right and Displace across the parlor to the kitchen. Knock out the waiter to get the dumb waiter key. How To Unlock Shan Yun’s Safe: One of the audiographs will unlock Shan Yun’s safe. Ride the dumb waiter to the second floor and remove the whale oil from the generator to disable the security system in the collection. Sneak into the collection room (right from the dumb waiter room) and take the audiograph from the display case. Play “Release Thy Golden Locks, Gloria” in the audiograph player. And that’s everything you need to know. It’s time to plan the big bank heist. Before leaving, you can complete all four contracts for extra cash, or purchase upgrades at the black market. The way out shouldn’t be a problem.